So my beloved stepmother Susan had a patch of boulevard below her house in Seattle that she didn’t know what to do with — she hated mowing it and it was boring. She also wanted a veggie garden but didn’t have enough sunshine anywhere in her yard. La voila! She and her dad built these swanky raised beds in the boulevard, and her mother (gardener extraordinaire) helped with the planting . The cool part is that she’s met a lot of her neighbors. People stop by and comment. She discovered that the guy across the street hunts ducks, and traded him some veggies for some duck breasts (and they might go hunting this fall. Ducks. Yum.) People stop in their cars to compliment her, and discuss the veggies. In general, it’s been a big hit in the neighborhood. 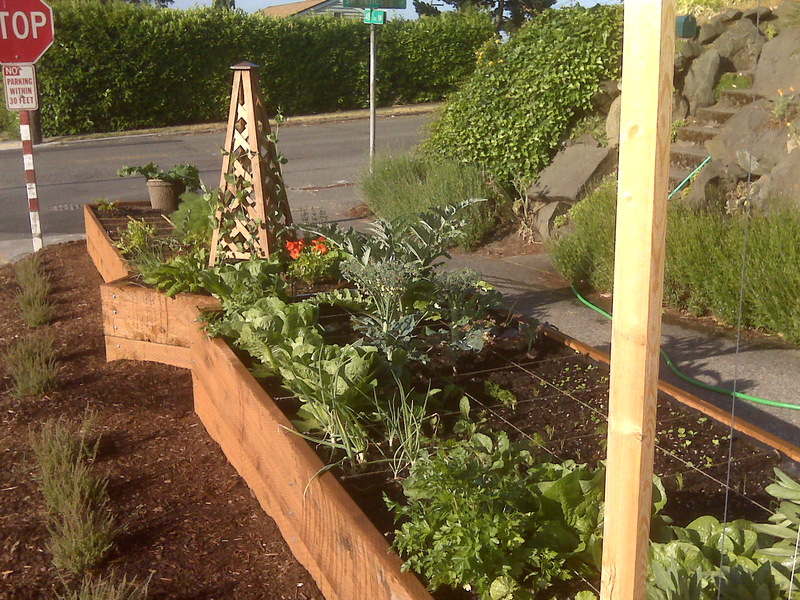 Which to me is the coolest part of the whole project — grow some veggies, make some friends, give everyone something more interesting to talk about than just boring old bushes.